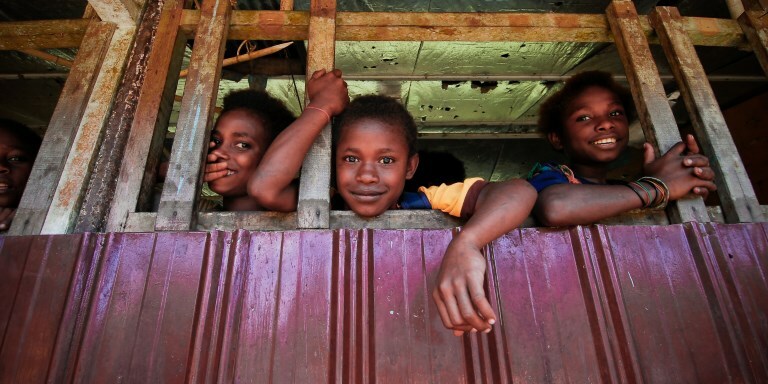 The Lae Port project paid particular attention to land and resettlement issues. About 4,000 people who were affected by the project were relocated and provided with livelihood skills and opportunities. Photo credit: ADB. Taking a risk-management approach to large-scale projects involves investing in project preparation and attending to stakeholders’ concerns early, such as land and resettlement issues. Upgrading of the congested Lae Port was crucial for Papua New Guinea to avoid further business losses, step up with international trade, and help boost the economy. In 2007, the country embarked on a project that involved building new port facilities, including a tidal basin, a multipurpose berth, and terminal works to accommodate larger ships and more cargo. About 4,000 people who were affected by the project were adequately resettled and provided with livelihood skills and opportunities. In large infrastructure projects, the initial focus should be on the early resolution of land acquisition and resettlement issues. It would also be sensible to keep the project design simple and straightforward. This case study was originally published in Lessons from ADB Transport Projects: Moving Goods, Connecting People, and Disseminating Knowledge. Lae Port is Papua New Guinea’s largest, busiest, and most important port. It had been operating at full capacity and could barely accommodate more ships, especially larger vessels bearing higher volumes of cargo. Upgrading the port was deemed crucial to avoid further business losses, scale up with international trade, and help boost the country’s already sluggish economy. Lae Port is Papua New Guinea’s center for imports and exports, and a hub for distributing cargo to and from the communities along the coastline and the country’s inhabited islands. It also serves as a gateway linking the world market with a large hinterland comprising Morobe province and five resource-rich provinces in the Highlands. The Highlands is home to about 5 million of Papua New Guinea’s 7.4 million people and represents half of the country’s territory. Papua New Guinea’s most significant road, the Highlands Highway, runs from Lae to Mount Hagen in the Highlands region, dispensing imports ranging from heavy machinery to food products and bringing the country’s major export items to Lae Port. Approximately 50% of the country’s exports are shipped from the port. Since 1995, the volume of cargo handled at the port has steadily increased by 142,000 revenue tons each year on average, at 12 tons of cargo for every twenty-foot equivalent unit (TEU). The port sought to adapt to the demands of container operations, but international ships had increased in size and in carrying capacity as had coastal trade vessels. By 2008, Lae Port was operating at its capacity limit with throughput reaching 2.8 million revenue tons. In 2007, the Asian Development Bank (ADB) and its development partners provided assistance to the Government of Papua New Guinea in building new port facilities, which will increase cargo-handling capacity, promote trade and private sector investments, and contribute to economic growth. The Independent Public Business Corporation, which manages state-owned enterprises in Papua New Guinea, oversaw project implementation. The facilities were completed in 2015, and the project was financially closed in 2016. ADB paid particular attention to land and resettlement issues in its policy dialogues with the government since land ownership in Papua New Guinea is a very sensitive and controversial issue, and resettlement was considered the biggest risk to the project. Expansion of the Lae Port called for the relocation of about 543 households, with a population of about 4,000 people, who were then occupying the project area. Project implementation was delayed for 2 years because of complex relocation negotiations with affected people. The government had to ensure that the land for the project was national land and that affected households were adequately relocated and compensated. Extensive public consultations were conducted with government officials, the business sector, local communities, affected people, and international and national NGOs. The consultations were held to explain ADB’s policies on the environment, resettlement, and procurement; increase project awareness; build project ownership; address technical, environmental, and social concerns; and identify appropriate project interventions. The stakeholders showed a keen interest in the project, the eagerness to benefit from it, and expressed concerns related to environmental and social issues. Their concerns were considered in the engineering design, the environmental management plan, the resettlement plan, the livelihood initiatives, and the project design. More than 1,000 stakeholders were consulted. The Japan Fund for Poverty Reduction, administered by ADB, provided a livelihood and social improvement program to complement the resettlement program and further ensure livelihood sustainability. Instead of improving the existing port, it was less complicated to build new port facilities because the old terminal area was not large enough for efficient port operations. Also, the existing berths were built on a steep foreshore with increasing risks of geotechnical instability, heightening the financial risks of any improvement. In addition, the new port facilities allow more berths to be built at a relatively low marginal cost, while opportunities to extend the existing berths were limited. A tidal basin was constructed to extend the port area into the large swamp northwest of the property. This project was the first phase of the tidal basin master plan and part of the blueprint drawn up by the Morobe Provincial Government to promote industrial development in Lae City, the provincial capital. The tidal basin was constructed along with a multipurpose berth, buildings, container storage area, roads, drainage, water, electricity, and sewerage services. Rail-mounted quayside gantry cranes, heavy mobile cranes, and heavier handling equipment were also installed. The tidal basin and berth were designed for medium-sized cargo vessels. The geotechnical surveys and detailed engineering and design were completed during project preparation. Dredging and construction of the wharf and terminal were packaged into one contract to ensure economy in administration and avoid interfacing problems. Project implementation schedules were conservative, which enabled the contractors to progress ahead of time. The OPEC Fund for International Development cofinanced the civil works for the new port facilities, while the Australian Agency for International Development assisted the PNG Ports Corporation Limited in strengthening its institutional capacity to manage its capital and maintenance investment programs and improve port services. By 2010, preconstruction activities were mostly complete, but the total project cost had increased from $154.0 million, as estimated in 2007, to $291.4 million. This was because of high inflation in the construction sector. In 2011, ADB approved the government’s request for additional financing to cover cost overruns and project design modifications. The increase in project cost was due to a combination of factors, including the global financial crisis that caused the depreciation of the US dollar against other currencies, including Papua New Guinea's kina; increases in the cost of structural steel and concrete and nonimported items including labor, materials, and energy; and design modifications to improve the technical quality of construction solutions. The project’s technical feasibility was strengthened, and higher-than-original economic and financial returns are expected. The government confirmed that the overall project is a nationally important strategic investment. The project incorporated a fish pass into its design, to ensure that no fish and other aquatic animals will be carried into the hydropower turbines. The fish pass will be 774 meters long, and will provide a channel where aquatic animals can pass. In addition, important fish habitats will be identified and protected. Expansion of Papua New Guinea's Lae Port is expected to increase trade for one of the poorest countries in Asia and the Pacific, turning the seaport into a gateway linking the country to world markets. Video credit: ADB. The Lae Port Development Project transformed a swamp area that had negligible economic and financial value into an industrial park or free trade zone, where the country’s export products can be processed and take on added value before being exported. About 4,000 people were relocated from the project site, including the Labu people. Households were relocated to better land in the Malahang area of Lae City. Each household was initially to be provided with a 700-square-meter residential area, a one-bedroom house with reasonable living conditions, and relocation assistance. Because of constraints, such as acquiring land for housing, this was later replaced with a cash assistance scheme. The canoe landing site of the Labu people near the port was also rehabilitated. Through the livelihood and social improvement program, 11 schools and eight health facilities, community centers, a sports area, and an all-weather market in Malahang were established. Income-generating opportunities and livelihood-enhancement training for women and men were conducted. The training aimed to provide the project-affected people, including the Labu, with vocational skills to start small businesses, such as cocoa planting, inland fish farming, and mud crab fattening. A local NGO and local service providers were engaged to implement these livelihood training. Other interventions included assisting affected people and the Labu in improving techniques in small-scale agriculture and animal husbandry and marketing of their products, assisting the Labu in community-based fish culture, and providing microcredits to affected people and the Labu. Expanding the capacity of Lae Port required the construction of a 2,800-square-meter tidal basin in a swamp area northwest of the existing port facilities with a dredged depth of 13 meters below chart datum. A multipurpose berth, 240 meters long and 45–50 meters wide, was also built with provision for extension by another 150 meters without incurring dredging cost. The tidal basin and berth were designed to accommodate vessels with an overall length of 200 meters, beam of 32.2 meters, and fully laden draft of 12 meters, including “Panamax” container vessels of a maximum 50,000 deadweight tons. A container yard of 12.7 hectares was provided behind the wharf structure. The expanded port also features an administration building, cargo shed, navigation aid towers, infrastructure services, and security fencing, port link road pavement, and a diversion channel for the Mai Creek. The project offers lessons on implementing port development projects that involve large and long-term infrastructure investment that necessitates sustained engagement with government and other project partners. The policy dialogues between ADB and the government during project preparation focused mainly on resettlement arrangements and monitoring. Land acquisition and resettlement required comprehensive discussions with various stakeholders before project implementation. The land issue was extensively studied, and the resettlement plan and a livelihood and social improvement program were formulated in an equitable way to minimize social risks. The continuous policy dialogues helped resolve relocation issues and enhanced project ownership by the government. Large, ADB-financed, infrastructure projects in Papua New Guinea have been prone to substantial delays. A complex design and implementation arrangement covering wide sectors often leads to project delays and implementation problems. The construction of the Lae Port was simple and straightforward in design, and was focused on crucial physical infrastructure. The port is in a confined space, allowing effective risk management and environmental impact mitigation activities. A design-and-build package was included in the contractor’s scope of works, which was proven effective and efficient in delivering the infrastructure. ADB. Papua New Guinea: Lae Port Development Project.